But back in the real world, it doesn’t always work that way. Take, for instance, Ibrahim al Qosi, the former detainee who has reemerged in AQAP propaganda videos pushing the takeover of Saudi Arabia and a severance of the U.S./Saudi alliance. 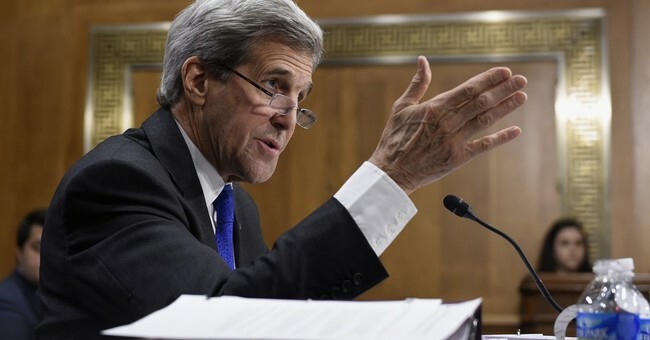 Appearing before the State, Foreign Operations, and Related Programs Subcommittee of the Senate Appropriations Committee, Kerry made the statement while testifying about the State Department’s budget request for the fiscal year 2017. During the hearing, Sen. Mark Kirk (R., Ill.) asked Kerry for his thoughts on Ibrahim al Qosi, the former Guantanamo detainee who is now a prominent al Qaeda leader, and had staffers hold up a picture of the terrorist for Kerry to see. Al Qosi was an aide to Osama bin Laden when he was taken to Guantanamo in 2002. He was released 10 years later after pleading guilty to war crimes in 2010 and was sent to his native Sudan. Upon the terrorist’s release, his lawyer, Paul Reichler, said al Qosi was looking forward to a quiet life of freedom, but the two never had contact after al Qosi left Guantanamo. Kerry assured Kirk that there will be ‘consequences’ for al Qosi’s return to the battlefield (kind of like the infamous red line?) but that overall, keeping Guantanamo Bay open was un-American. “The fact is that we’ve got people who’ve been held without charges for 13 years, 14 years in some cases,” he said. Mind you, here’s a glimpse of what life at Guantanamo is really like—hint, it’s a far cry from the “medieval dungeon rife with human rights violations and horrifying conditions” the left would like you to believe. But the real GITMO is quite another story, with detainees regularly watching movies and cable TV, spending time outside, playing video games, taking advantage of their religious freedom afforded to them by U.S. values, being given medical treatment and more. But as they say, no good deed goes unpunished and detainees often times urinate on guards and throw feces. And, when all is said and done, 30 percent of the released or transferred detainees pick up right where they left off.